Yelloweye Rockfish are a common catch off the coast of Vancouver Island. These fish will range from 5 pounds up to 30 pounds. In keeping with their name these fish have bright yellow eyes. Many people call these fish Red Snapper. Their eyes are highlighted with a spine above each eye socket and rough ridges behind each eye. Their coloring is a yellow-orange and the fins are pink with black on the tips. A large spiny dorsal fin is another characteristic of these fish. 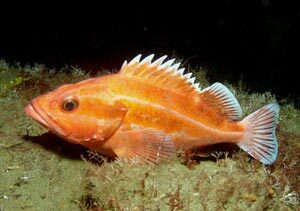 Yelloweye rockfish are slow growing. A fish weighing 20 pound will be approximately 60 years old.